It is priced at Rs 10 and has been tried and tested at the AIIMS (All India Institute of Medical Sciences). Students at the Indian Institute of Technology (IIT)-Delhi have developed a "stand and pee device" for women to avoid dirty public washrooms. The device, "Sanfe (Sanitation for female)", was launched on the World Toilet Day on Monday. The device has been launched with a #StandUpForYourself campaign under which one lakh free samples of the product will be distributed to women across the country. "Lack of hygiene in public washrooms exposes one out of every two women to Urinary Tract Infection (UTI). 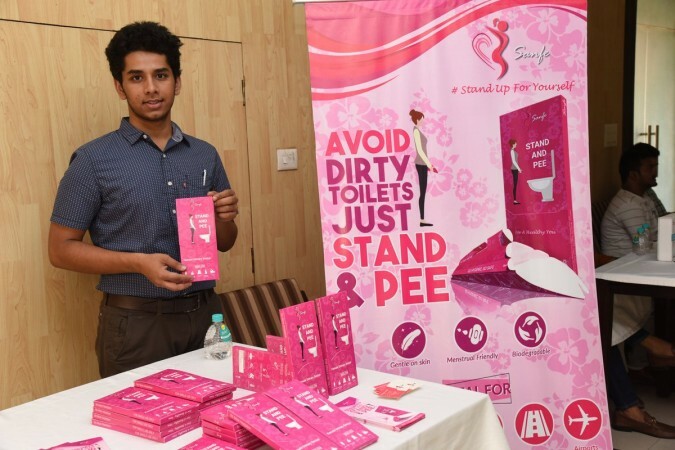 Concerned by this we innovated this female stand and pee device so that they can maintain a safe distance from the toilet seats and protect themselves from the possibility of getting infected," Archit Agarwal, a BTech student and the co-founder of Sanfe, said. "Sanfe will also liberate females from the constant burden of withholding their urge to pee. The product will be ideal for pregnant women, women with arthiritis, differently-abled, to be used at public toilets at railway stations, trains and bus terminals," he added. The coating material of the product is water resistant in nature. It is biodegradable and ergonomically designed. Women can also use this during their menstruation cycle. "It has a flexible design and needs only a single hand to use, which is extremely useful in case of women wearing traditional Indian attire. The flaps in the onetime use product are gentle on the skin to ensure that no scratch or itch takes place," Agarwal said.